FAO’s forest definition considers forests to be basically just “a bunch of trees”. This ignores the vital interconnections with other life forms. 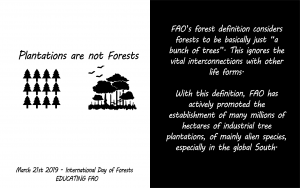 With this definition, FAO has actively promoted the establishment of many millions of hectares of industrial tree plantations, of mainly alien species, especially in the global South. The terms “Forestry” and “Forests” may sound similar and are sometimes used interchangeably, but they refer to very different things. Forestry reduces forests to their potential for wood production. Hence, FAO argues that you can “plant” forests. The reality is that it is only possible to plant trees. 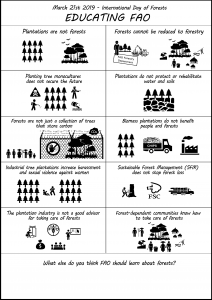 When FAO created a “Forestry department” (and not a Forest department) it shows that the “forestry” concept has priority in its policies. FAO’s message during the International Day of Forests in 2013 was “plant a tree, plant our future”. But whose future? The large-scale monocultures which FAO promotes threaten the life of rural communities because they have devastating impacts, such as invasion of fertile community lands, massive water consumption and use of toxic inputs. They are a driver of deforestation and a false solution the climate crisis. FAO spreads the message that tree monoculture plantations can “provide a number of social and environmental services”, including “soil and water protection”. However, when FAO chose the theme of Forests and Water for the 2016 International Day of Forests, its video only showed forests. The video intentionally excluded images of industrial tree plantations that deplete water sources and degrade soils. International climate talks have reduced forests to a mere carbon store. FAO promotes this reductionist vision. Its 2015 International Day of Forests emphasized the role of forests and trees as merely a store of carbon. This concept paved the way for forest carbon programmes that grab forests and criminalize forest-dependent communities. The only safe and urgent solution to the climate crisis is leaving fossil fuels underground. FAO’s documents argue that “forestry”, done well, “will provide multiple benefits, including improved energy production”. But large-scale biomass energy plantations destroy peoples’ land and forests while benefiting corporate interests. The question about “improved energy production” is therefore: for what and for whom? Among the invisible impacts of industrial tree plantations and industrial logging are harassment and sexual violence against women. Although FAO has produced some relevant documents on women and forests, these do not address this abuse against women. FAO claims it is helping countries to “manage their forests in a sustainable way”. Yet, the old destructive industrial logging model is hiding behind FAO’s concept of SFM. By giving support to SFM, FAO -as well as certification schemes like the FSC– allows industrial logging to continue. FAO receives advise from the so-called Advisory Committee on Sustainable Forest-based industries. Its members come mainly from the tree plantation industry, which is responsible for deforestation and land grabbing. Communities that depend on forests have a deep knowledge about them. FAO must relearn about forests and the harmful impacts of the tree plantation industry from forest-dependent communities and other communities affected by this industry. What else do you think FAO should learn about forests?